This is a true happening during WWII. The story is about US submarine sailors, a Japanese serviceman and hand grenades. No names will be revealed other than mine and the one to be mentioned later. Reason – I just do not remember the other submarine crew member’s names. At the end of the fifth war patrol the USS Guavina was ordered to Subic Bay, in the Philippines, for repairs and upkeep, plus replenishment of supplies, ammunition, fuel oil and all other necessities to return to the patrol area. This was an advanced base facility consisting of the submarine tender Griffin, anchored out in the bay and protected by the cruiser USS San Diego, who was SOPA. It was the cruiser’s responsibility to protect the tender and the submarines present from Japanese air raids, which was sorely needed. Our first night moored alongside the tender was filled with three separate air raids and the San Diego did a fine job in protecting the tender and the submarines tied along side. Also present were the submarines Flounder and Hoe. Just a few days before, on February 23, 1945, the Hoe collided with the Flounder underwater and cut a 25 foot gash in the Flounder’s starboard superstructure. This was the only submerged collision of two US submarines in the war. Normally after a patrol the submarine crew would be granted a two week rest leave and would be allowed to travel elsewhere. However, there were no facilities except for a Navy beer hall ashore at Subic Bay and the hours were controlled for handing out beer. In order to keep out of the way of the relief crew workers most of the submarine crew would take a motor launch to a small pier at the water’s edge and roam around the shore line talking with the Philippine people. One day there was a group of four or five submarine sailors from the Guavina, myself included, waiting at the pier to be returned by the motor launch when out of the jungle appeared a Japanese service man dressed in clothing very similar to that of US Navy dungarees. The problem was that he also had two hand grenades – one in each hand. The grenades were blatantly displayed. He approached our small group with arms and hands out stretched. Very calmly, Charles “Elmer” Botts, TM3SS, from the Guavina, approached the Japanese. “Elmer’s” arms and hands were out stretched with his palms upward. Our minds were all saying “what is next?” Fortunately, the Japanese gently placed the grenades into “Elmer’s” out stretched hands. The Japanese then used his empty hands to gesture for food and water. In a matter of seconds two US Navy Shore Patrolmen entered the scene from the jungle and took away the Japanese person. To this day I do not remember what happened to the hand grenades nor do I recall one word being mentioned about this incident upon return to the submarine. I do suspect that the hand grenades were also turned over to the US Navy Shore Patrol. “Elmer” lived in Williamsport, PA and is where I enlisted into the Navy. Williamsport is located about 40 miles north of my home town in PA. A few months after the incident “Elmer” and I were home on a 30 day leave and I spent a couple days of my leave with him. The war ended and I did not see “Elmer” again until about 1950 when he appeared at a Naval Reserve Center in Williamsport where I was attending reserve meetings. That was the last time I saw “Elmer.” A few years later I received word from my parents that “Elmer” was killed in a one car accident not too far from their home. So “Elmer” buddy, thanks for your courage at the Subic Bay incident – and – SAILOR – REST YOUR OARS !! At the age of seventeen I enlisted into the Regular U. S. Navy and was sent to the Sampson Naval Training Station in New York State for my basic training. (Boot Camp). At the completion of basic training I remained at Sampson and attended Radioman School. I graduated ranked second in my class and was granted a Petty Officer rating of Radioman 3rd Class. I volunteered for Submarine Duty while in Radio School and upon completion of that school I was transferred to New London and entered the Basic Submarine School. This training was followed by courses in Advanced Radio and Sonar. Upon satisfactory completion of these courses I was transferred overseas to the Southwest Pacific. My first duty station was aboard the submarine tender USS Fulton anchored in Milne Bay, New Guinea and I worked in the Communication group for the Commander Task Force 72. After a few weeks this command shifted to the submarine tender USS Eurayle and shortly after that the command transferred to the U. S. Submarine Base, Brisbane, Australia. It was while at Brisbane that I was assigned aboard the USS Guavina SS362. She had completed War Patrols #1 and #2 and both patrols were successful. I was aboard Guavina for War Patrols #3, #4, #5 and #6 which were all successful patrols. After Patrol #3 I received my Submarine Combat Pin. I was warded a gold star for the pin for each patrol of the remaining patrols. During Patrol #4 I completed my requirements for submarine qualification and was authorized to wear the submarine dolphins. It was also at this time that I was promoted in rating to Radioman 2nd Class. After the sixth patrol, Guavina was ordered to return to the States for a major overhaul in May 1945. When the overhaul was completed, Guavina departed from the San Francisco area in early August and arrived at Pearl Harbor about the same time that the announcement came that the hostilities with Japan had ceased. About mid September 1945 we departed for United States carrying many POWs, most of them submarine POWs who were being held in Japan. Orders sent us to the Mare Island Naval Shipyard where the Guavina was finally de-commissioned. I remained with her until my honorable discharge in August 1946. At this time I enlisted in the Naval Reserve and returned to my home town in PA. Shortly afterward I enrolled in a television engineering school in Chicago and while there I attended Naval Reserve meetings at Navy Pier. After completing the school I returned to PA and was employed by Westinghouse Electric Company for over 23 years. Positions held with Westinghouse were electronic technician, quality control patrol inspector, test supervisor, production engineer and assistant manager on a government project. During this period of time I attended Naval Reserve meetings at Williamsport, PA and went to New London for two weeks training per year aboard the boats. Early 1951 I was recalled to active duty and was assigned aboard the submarine USS Amberjack SS522 operating out of Key West, FL. Shortly after being assigned to the submarine I was awarded advancement in rating to Radioman 1st Class as the result of a fleet wide competitive examination. 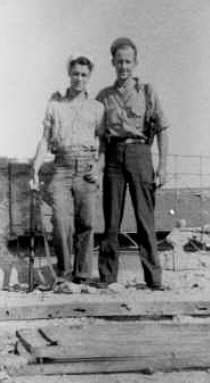 Late in September 1952 I was released from active duty and returned to civilian life and my employ with Westinghouse. In the early 1970’s Westinghouse discontinued its manufacturing of home entertainment equipment such as television, radios, and stereos and it was at this point I went to work for Johnson & Johnson and was in their employ as a Quality Control Supervisor until I retired in 1988. Hobbies: During my early years I was active in most sports with basketball being my favorite. Hunting, fishing, target shooting, camping, hiking, swimming, golf and cameras were all part of my earlier life. Presently the hobbies are limited to sub vet activities, amateur radio (Morse Code only), learning the computer and kite flying. Family: Son Steve – 55 years of age – a navy carrier sailor during the Viet Nam era. He and his wife Chris have a son age 33 and a daughter age 28. All four of them live in the state of Maine. My daughter Brenda age 50 lives in the state of Virginia with her horses, dog, cat and any other stray that comes along.